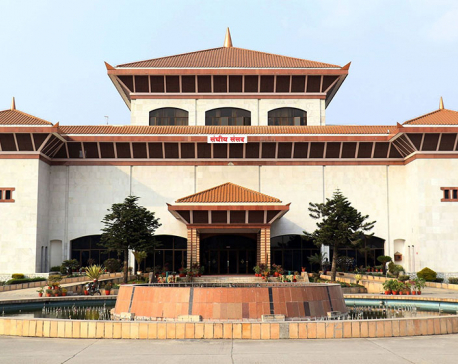 KATHMANDU, June 17: Budget spending for development projects and programs has been extremely slow in the current fiscal year, despite expectations that development spending would take pace with new government in place. Only thirty days are left in the current fiscal year, and the government has yet to spend more than half of the budget for capital spending. Spending target of development budget has been set at Rs 335 billion by the federal government. However, the amount spent till Thursday, the last day of the first 11 months, stands at only Rs 161 billion or only 48.32 percent, according to Financial Comptroller General Office, the government agency that keeps record of government accounts. The current government that came to power in February riding on a promise of prosperity and development, is apparently stable. But early indications show it is not delivering the results, and its priorities are not in project execution and spending the money in time. On an average, 20 percent of the money allotted for capital spending has remained unspent in the recent past years, and the story will be the same this year also, according to estimates by the government. Prime Minister KP Oli had made few brief project visits including the Melamchi Water Supply Project and Tamakoshi Hydropower Project soon after he assumed office. But the projects are not in the government priority. The government is busy in programs of inauguration of event in capital city. The latest such inauguration by Prime Minister Oli was the property expo at Bhrikutimandap on Friday. “The spending progress shows only a repetition of the past trends, and early indications show there is no change,” said Economist Poshraj Pandey. “Focus of the finance ministry, which occupies a key position in the government, is only on collecting revenue, said Pandey. “Spending the amount is in shadow. Revenue collection target stands at 86.39 percent of the total annual target of Rs 730 billion for the current fiscal year as of Thursday. The empty state coffer had upset new Finance Minister Yuba Raj Khatiwada when he took office. In his white paper on the country’s economy issued in March, the technocrat-turned-politician minister had disclosed government’s coffer was empty as financial indiscipline was rife. Slow government spending also delays to trigger investments of the private sector, leading the country’s overall economy to remain the same. Independent studies show that the government’s spending of a rupee in development works triggers investment of Rs 3 of the private sector, highlighting the importance of public spending to draw private sector investments. Slow public spending has also effects in the availability of lendable cash in the banks and financial institution and this is also directly linked with the investments by private sector, which largely depends on the bank loans to finance their projects. Spending figures are likely to shot up in the last months of the financial year, as payment to the suppliers and contractors are normally put on hold for bargaining of kickback from the payments by the bureaucrats of each ministry and will be released in these months, economists and former bureaucrats say. Government’s action against non-performing contractors in the recent days has seemingly pushed them to show their performance in the project site. They were enjoying political protection in the past, according to news reports, but the progress in spending figures still remains bleak. 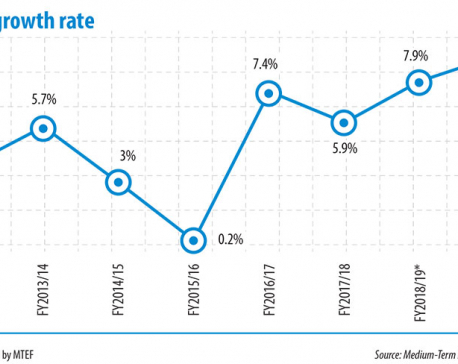 On the other hand, progress in recurrent spending is 77 percent of Rs 803 billion but rising costs of regular spending is a matter of concern for economists as they go largely in regular spending including paying salary. This practice does not have meaningful contribution in the economy and country’s development agenda. “It’s been an urgent need to downsize the recurrent costs to make fiscal space for financing mega projects,” said Bishwa Paudel in an interview with Republica last week.